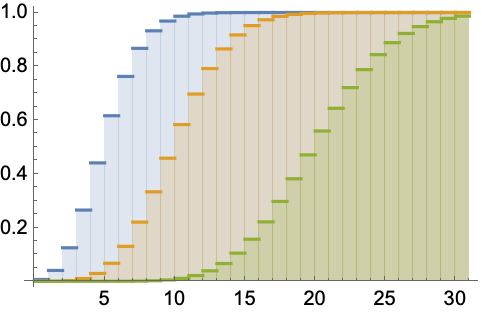 represents a Poisson distribution with mean μ.
PoissonDistribution allows μ to be any positive real number. PoissonDistribution[μ] represents a discrete statistical distribution defined for integer values and determined by the positive real parameter μ (the mean of the distribution). The Poisson distribution has a probability density function (PDF) that is discrete and unimodal. It is sometimes referred to as the "classical Poisson distribution" to differentiate it from the more general Poisson–Consul distribution (PoissonConsulDistribution), which is itself sometimes referred to as the "general" Poisson distribution. The derivation of the Poisson distribution dates to the work of French mathematician Abraham de Moivre from 1711. It is, however, named for French mathematician Siméon Poisson because of Poisson's utilization of the distribution to model wrongful convictions in the late 1830s. 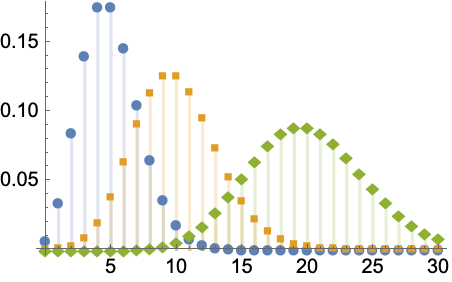 Classically, the Poisson distribution yields the likelihood of a given number of events occurring in a fixed interval if the events occur independently of the time since the last event and at a known average rate. Because of the techniques used to derive it, the distribution has been extremely useful in modeling situations consisting of a large number of independent trials with a consistent but very small probability of occurrence (e.g. the number of deaths per year of cavalry soldiers stemming from kicks by horse). The Poisson distribution has also been used to model a number of modern phenomena including internet traffic, phone call arrivals, and scoring in sporting events, and is a valuable modeling tool in areas such as finance, biology, physics, and telecommunications. RandomVariate can be used to give one or more machine- or arbitrary-precision (the latter via the WorkingPrecision option) pseudorandom variates from a Poisson distribution. Distributed[x,PoissonDistribution[μ]], written more concisely as xPoissonDistribution[μ], can be used to assert that a random variable x is distributed according to a Poisson distribution. Such an assertion can then be used in functions such as Probability, NProbability, Expectation, and NExpectation. The probability density and cumulative distribution functions may be given using PDF[PoissonDistribution[μ],x] and CDF[PoissonDistribution[μ],x], though one should note that there is no closed-form expression for its PDF. The mean, median, variance, raw moments, and central moments may be computed using Mean, Median, Variance, Moment, and CentralMoment, respectively. These quantities can be visualized using DiscretePlot. DistributionFitTest can be used to test if a given dataset is consistent with a Poisson distribution, EstimatedDistribution to estimate a Poisson parametric distribution from given data, and FindDistributionParameters to fit data to a Poisson distribution. ProbabilityPlot can be used to generate a plot of the CDF of given data against the CDF of a symbolic Poisson distribution and QuantilePlot to generate a plot of the quantiles of given data against the quantiles of a symbolic Poisson distribution. TransformedDistribution can be used to represent a transformed Poisson distribution, CensoredDistribution to represent the distribution of values censored between upper and lower values, and TruncatedDistribution to represent the distribution of values truncated between upper and lower values. CopulaDistribution can be used to build higher-dimensional distributions that contain a Poisson distribution, and ProductDistribution can be used to compute a joint distribution with independent component distributions involving Poisson distributions. PoissonDistribution is related to a number of other statistical distributions. It is generalized by PoissonConsulDistribution in the sense that the PDF of PoissonDistribution[μ] is precisely that of PoissonConsulDistribution[μ,0]. Moreover, PoissonDistribution is a limiting case for both BinomialDistribution and PolyaAeppliDistribution in the sense that the PDF of BinomialDistribution[n,μ/n] as n→∞ is precisely the same as the PDF of PoissonDistribution[μ], while the PDF for PolyaAeppliDistribution[θ,p] tends to that of PoissonDistribution[θ] as p→0. PoissonDistribution is also related to NegativeBinomialDistribution, GammaDistribution, GeometricDistribution, ExponentialDistribution, BorelTannerDistribution, BinomialDistribution, NegativeMultinomialDistribution, and MultinomialDistribution.